June has always been one of my favorite months; after all what is there not to like about June. Roses are blooming, kids are out of school, and it's warm enough to be outside in the evening. Life is good in June. Jeanne Robertson is coming to Springfield, MO for a show on June 9 so this June is very exciting in our house. Mr. Bruce has several DIY projects planned for the summer. I'm afraid to ask him too many details because the projects might involve me. He finished laying the new laminate flooring in his bedroom a couple of days ago and got the bedroom furniture back in place. It sure brightens up the room, next is new curtains. Normally Mr. Bruce is not a DIY type person; he is more of a "call the man" type. I have a long "to-do list", it's the same one that I had on January 1, 2012 that I made sometime in 2011. 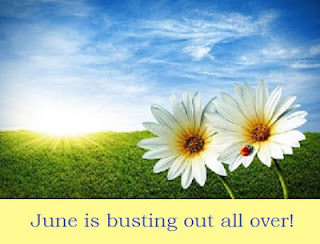 Let's get back to positive things about June. Baseball fans are deciding who should go to the All-Star game. (My #1 choice, Yadier Molina, catcher with the St. Louis Cardinals.) The US Open is June 14-17, that's a big golf tournament. Father's Day is June 17, I wonder what Mr. Bruce wants? Have to go now and enjoy this beautiful June day in the Ozarks. May you enjoy your June day also.